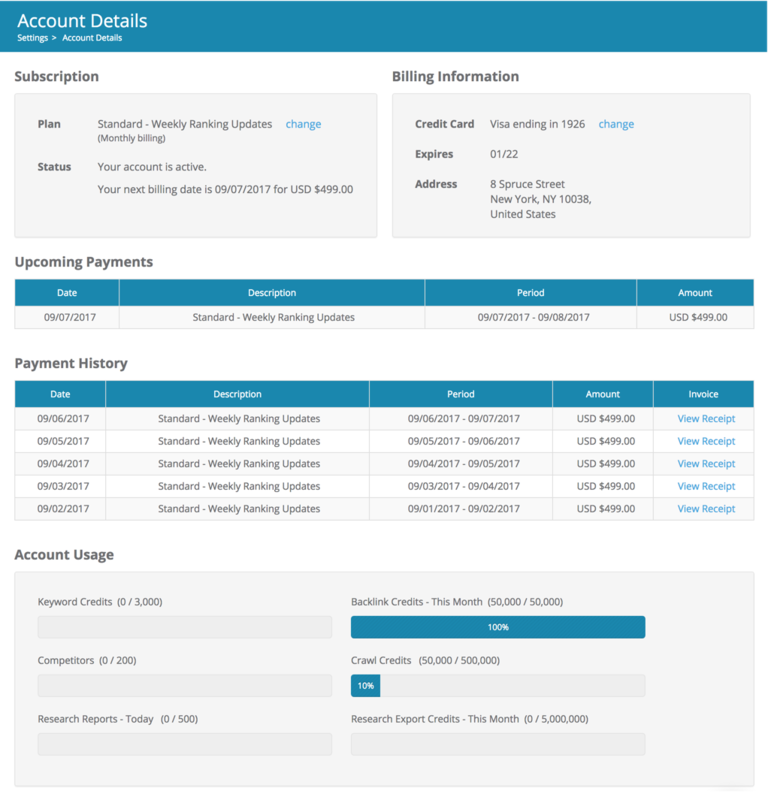 The Account Details allows users to manage subscription, billing methods, view payment history, download invoices / receipts, view current credit usage and other important information about their account. 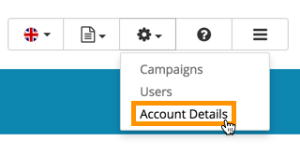 By default, this page is only accessible to the Account Owner user of the account, and can be accessed by clicking on Account Details in the Settings menu. Access permission to Account Details page can be granted by Account Owner user to any other users in the same account under User Details page. The subscription plan the account is currently in, including the payment terms (Usually are monthly or yearly) and ranking update frequencies (Usually are weekly or daily) for your account. Learn more about our plans in our pricing page. Clicking on the change button will take you to the pricing page, allows you to switch to another plan. Whether your account is in good standing in terms of payment, next billing date and amount are also shown. If your account has overdue payments / issues with your payments, you account's status might turn into Delinquent status, not settling your overdue payments within your Delinquent period can cause your account to expire. If you are having issues about your payments in Dragon Metrics, please contact our support and we'd be happy to assist. The payment method currently used in the account with additional information about the current payment method. Clicking on change next to your current payment method will allow you to make changes to your billing information or switch to another payment method. The date issued, description, payment period and amount for any upcoming payment items for this account. All the historical payment will be shown in this table with specific details about each payment, receipt for each payment can be downloaded by clicking on View Receipt text in the Invoice column of each row. Learn more about credit usage in Dragon Metrics.